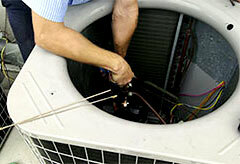 We’re the answer for all of your Residential Heating and Cooling Needs. We service Central Ohio and specialize in repairing and maintaining heat pumps, gas and electric furnaces, and air conditioning units; we’ll also install new units when your existing equipment needs replaced and is beyond repair. Minutemen Heating and Cooling is a family owned business and one of the Columbus area’s leading fossil fuel contractors. As mentioned above, we also perform inspections for realtors and their clients when buying or selling a home. Check with your warranty provider to find out if we are a preferred provider. We would love to have you as a customer! All of us here at Minutemen Heating & Cooling want our customers to know how much we value and appreciate them. We also acknowledge how important it is to know that you are dealing with a reputable, honest business operation. For 34 years, we have been fortunate to serve a long list of satisfied customers. Ask any of our customers and they will tell you that we have been keeping them comfortable and their equipment functioning at its best.